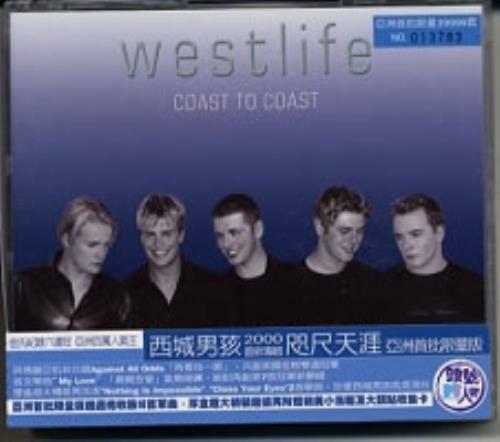 WESTLIFE Coast To Coast (Taiwanese official 18-track CD album with bonus facsimilie signed fold-out poster & set of picture/lyric cards to put inside your filofax, picture sleeve & obi strip). Condition : This item is in Excellent condition or better (unless it says otherwise in the above description). We buy items as close to Mint condition as possible and many will be unplayed and as close to new as you could hope to find. Irrespective of the source, all of our collectables meet our strict grading and are 100% guaranteed. Click here for more info. Availability: Sold Out - 'Request Next' to get an email if it comes back into stock. Language: Regardless of country of origin all tracks are sung in English, unless otherwise stated in our description. email: sales@eil.com to contact our sales team. eil.com (also known as Esprit) has been the world's biggest and best seller of premium quality and top condition rare and vintage vinyl records, rare CD's and music memorabilia since 1985 - that's 34 years! And we are proud of it. We have over 500,000 happy customers in over 100 countries worldwide, are a platinum seller on Ebay and have an average positive rating of over 99% on Amazon sites worldwide. Your order will be shipped the same day (Monday to Friday) in custom made superior packaging. All orders carry our 100% customer satisfaction guarantee. If you don't like it, just send it back for a full refund. We're always on the phone to answer questions and help with any orders, Monday through Saturday. It is 100% safe and secure to order from us as we have been independently verified by GEOTRUST and your data is transmitted using 128 bit encryption with 'Extended Validation SSL' achieving the highest level of consumer trust through using the strictest authentication standard. See the padlock symbol shown by most browsers when you checkout. We guarantee 100% privacy. Your information will not be shared. And you can un-subscribe with one click at any time.